Hi everyone! The other day I was thinking about how much waste I create each day from my everyday tasks, and it's not a particularly small amount. I've been investigating how I can live a more sustainable lifestyle, especially when there's already so much pollution and waste in the world. With Earth Day coming up on April 22, let's all try to be more conscious about our habits, appreciate what we have, and see what changes each of us can do to help our planet. 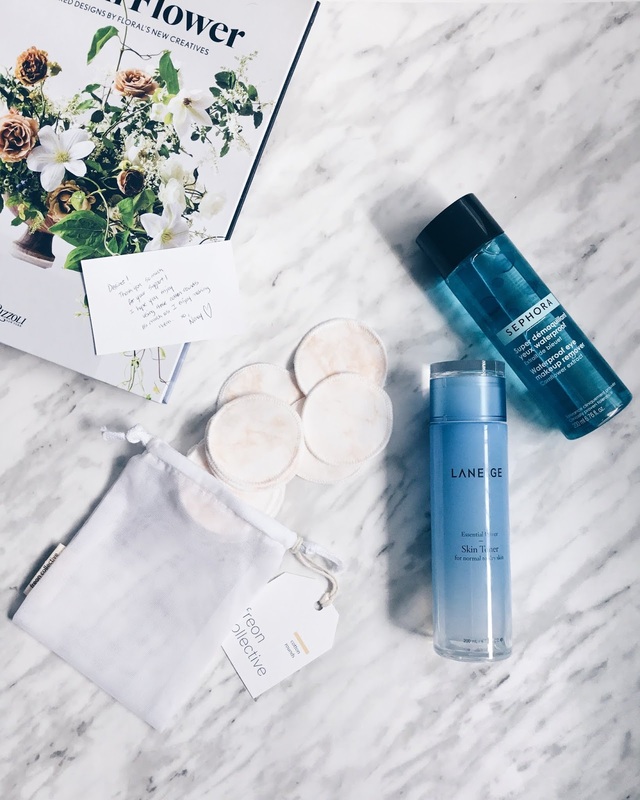 These are a few things that I've implemented in my lifestyle to be more eco-friendly! All the products that I purchased will be linked so you can look into them as well! I use cotton pads daily, so each day I would throw out at least one disposable round. Over time that accumulates to a whole lot of cotton pads in my garbage! 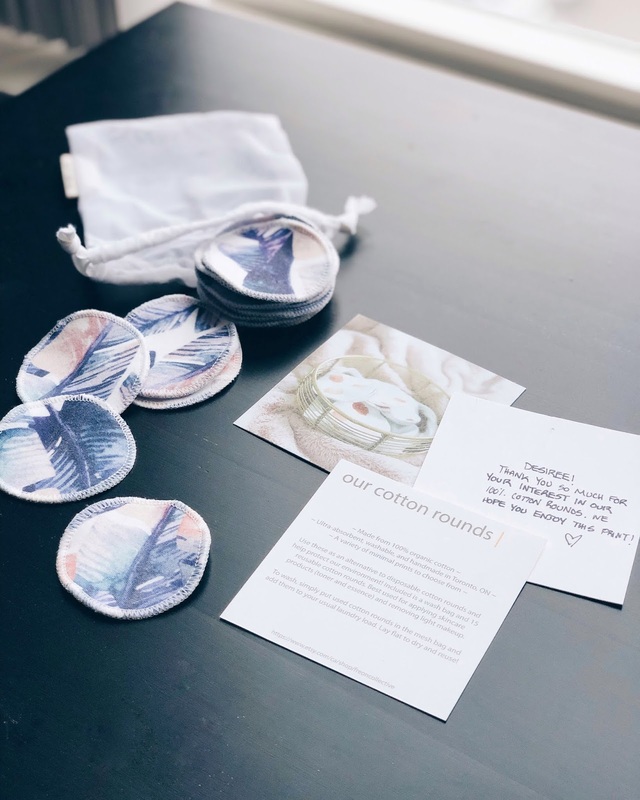 Freon Collective has helped me be more sustainable in my skincare routine with their reusable cotton rounds! There are so many designs to choose from and they're all made with 100% organic cotton! It's another bonus that they're locally made here in Toronto. I have two of their sets, the blush marble design and this tropical feather design. Once I've used all the rounds in a set, all I do is throw them into the mesh bag that they came in into the washing machine and lay flat to dry! I rotate between my two sets, and it has made such a huge difference: I create less waste and spend less since I don't have to repurchase disposable ones! You can see all the different designs and purchase them on their Etsy shop here. Use the code "DESIREE10" for 10% off your purchase until April 19, kindly offered by Freon Collective for you guys!! The majority of straws are made with plastic, so to reduce the use of plastic I've purchased reusable straws to use at home. I have my glass bubble tea straw from Glass Sipper and stainless steel drinking straws from Kitchen Stuff Plus. You can also find straws made with bamboo too. Most of these come with a straw cleaning brush so they're easy to wash. I use these at home, but you can take it a step further and bring a straw with you wherever you go. Think of the plastic that you'll prevent from entering our landfills! - My cute tumbler with the reusable straw from Miniso is for the iced coffee I make in the summer! The exact one is not available anymore but they still have something similar to that. - The Tealyra Travel Mug comes with a steeper for my tea! My husband gifted this to me for Christmas a few years ago and I still love it. - Klean Kanteen Insulated Mug for my regular hot drinks on the go. Give clothes, shoes, accessories, or home decor a second life when you thrift or buy second-hand! Of course it depends on the condition and whether you find pieces that suit your style. However, you spend a lot less compared to the same thing new, it helps the environment since it already exists and it's not being wasted. You can really find treasure at places like Value Village or Plato's Closet, which are two places that I go to for thrifting. My whole outfit here along with my bracelets were from Plato's Closet! Energy- saving is also environmentally friendly because there'll be less electricity used. Electricity generation from the burning of fossil fuels contributes to pollution and global climate change. Even if that's not the main way your area generates electricity, it is still good to be aware of that and still take steps for a healthier, eco-friendly lifestyle. Of course there are many other factors involved to generate electricity, but the smallest action can help. For the apps that have different light settings, I keep them on dark/night mode so less energy is used, it's easier on my eyes and I don't have to charge my phone as often. The battery-saving function on devices is also a great feature to save energy. I unplug electronics that are not used often because it still uses electricity if the device is off but still plugged into the outlet. I'm always looking for new ways to improve my lifestyle, so if you have other sustainable tips, let me know down below in the comments! Hope this post inspires you to make a small change for our world!